On March 28, there was a special lecture about the “Tradition and the Future of the *Bildungsroman” at the College of the Liberal Arts, targeted for graduate students and the professors from the English literature department. This is the first lecture from the series of three special lectures directed by Institute of British and American Studies. 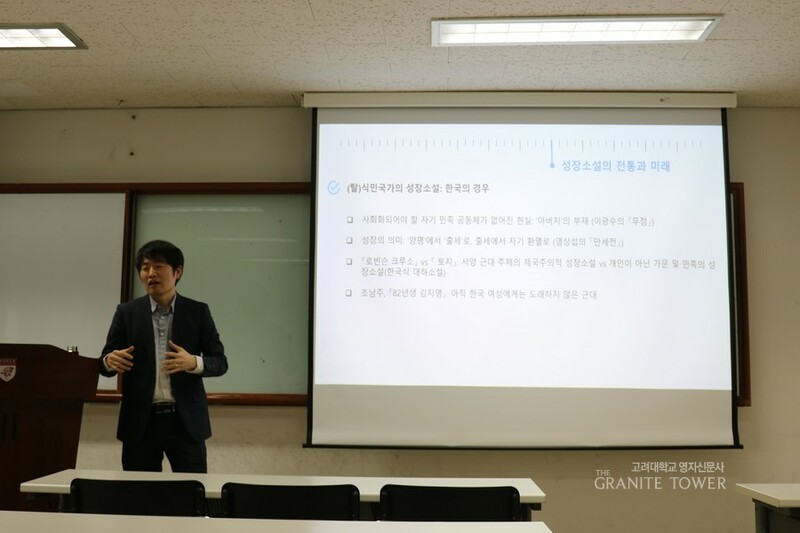 The lecture was taught by Dr. Sohn Ilsu, who studied Modernism novels and Bildungsroman. Dr. Sohn first gave an overview of the change of society by showing two lists on elementary students' preferences for future jobs. Unlike the 1980s, when students wanted to become a soldier or president, nowadays students preferred a YouTube creator or webtoon illustrator. Dr. Sohn emphasized that being aware of the changes the society have gone through could be an opportunity for researching new aspects of human growth and studying how it could be represented as a novel. Then, Dr. Sohn defined the traditional Bildungsroman by quoting several writers such as Fritz Martini and Meisters Lehrjahre. Traditionally, Bildungsroman emphasized the harmony between individuals and society by illustrating conformation to the social norm but also respect for one’s identity. Modern times, however, the concept has changed. Sohn explains the traditional definition of growth was only attainable from the upper class. The rest would fail to achieve such growth due to lack of time and resources, which in the contemporary Bildungsroman is also viewed personal growth. Dr. Sohn then gave an example, Madame Bovary (1856), which portrayed Madame Bovary, a farmer’s daughter as the main character. This novel eventually ends tragically, with self-destruction and deception of the main character. As our society is constantly evolving and changing, Dr. Sohn states it is important to reflect on the society and culture and figure out the Bildungsroman that represents today. “There are refugee kids, young kids who are committing suicide and family immigrants. What would be the Bildungsroman that reflects their society and culture?" Dr. Sohn ended the lecture with an open question for the future dedicators of this field.